A small, round fleshy root vegetable with a smooth skin that can range in colors from white to yellow, green, or scarlet. Inside, there is a creamy white flesh that is crisp textured and sharp flavored when raw, which mellows when cooked. The white and yellow varieties have a somewhat sweet peppery taste, while the green and scarlet are slightly milder. The Scarlet turnip is a mildly sweet variety that is cooked with its thin scarlet skins intact. As the turnip increases in size, their flavor intensifies. By blanching the larger turnips in boiling water for approximately 5 minutes, the intensity of the flavor is reduced. Turnips can be eaten as a snack, cut up and added to a salad, other vegetable dishes, soups and stews, or they can be cooked and eaten mashed or sliced as a side dish. They can be boiled, baked, braised in a stock, steamed, stir-fried, roasted, or microwaved, but should not be overcooked, retaining some crunch to the vegetable. Turnips can also be pickled. They generally store well and can be kept in a refrigerator wrapped in plastic with air holes for one to three weeks. If blanched, they can be frozen and kept for longer periods of time. Turnips are available throughout the year but more readily available during the fall and into spring. 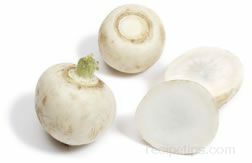 To select, choose smaller turnips that have smooth skins and are plump and heavy for their size. This root vegetable may be coated with a food-grade wax coating that is used to seal in the moisture and maintain the color of the vegetable. To store, place in a plastic bag and store in the refrigerator for up to a week.